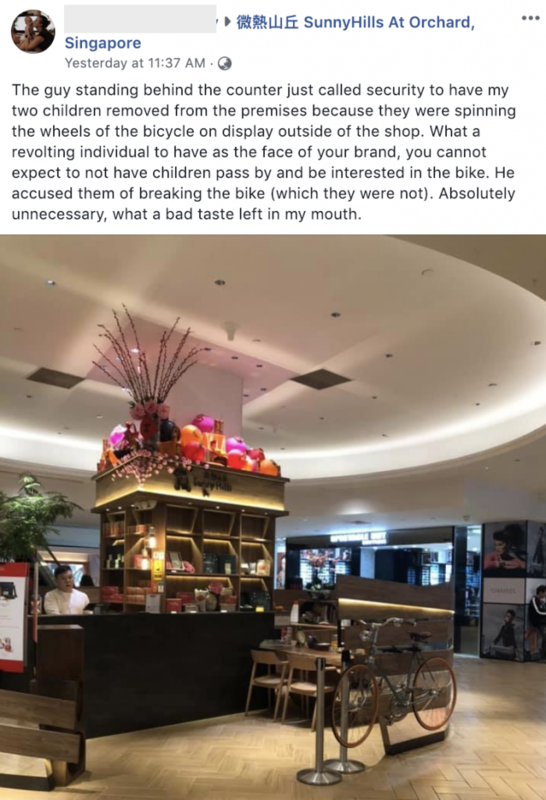 Singapore – On February 10, Sunday, an angry mother expressed her annoyance towards “a revolting individual” who advised her kids to stop playing with their shop’s bicycle on display. 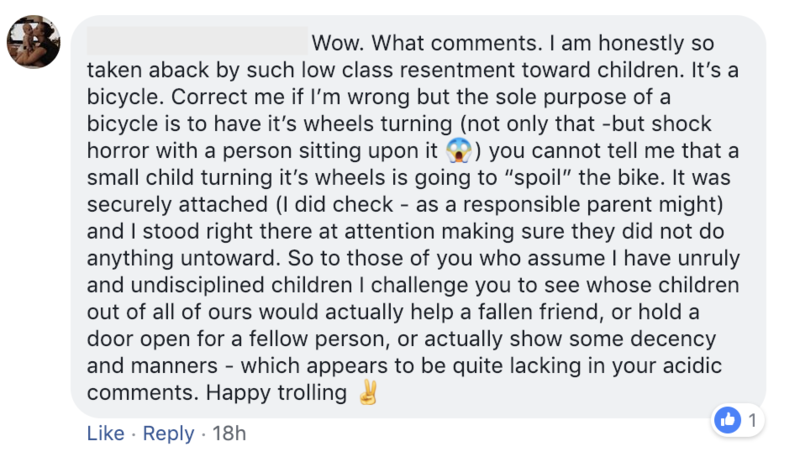 Posted in Facebook, the mother of two shared how a personnel of SunnyHills located at Ngee Ann City resorted to calling security to have her children removed from the area because they were spinning the wheels of their bicycle on display outside the shop. The guy standing behind the counter just called security to have my two children removed from the premises because they were spinning the wheels of the bicycle on display outside of the shop. What a revolting individual to have as the face of your brand, you cannot expect to not have children pass by and be interested in the bike. He accused them of breaking the bike (which they were not). Absolutely unnecessary, what a bad taste left in my mouth. The online community was quick to defend the shop by indicating that the bicycle was first and foremost the property of the shop and should respect the shop’s policies if it was not meant to be played with. Ms. Serene Tan also commented on how the action posed a risk to safety and someone could have gotten hurt in the process. Others also mentioned how they personally knew the “guy behind the counter” and that he was a very nice professional. SunnyHills has also given an update and apologised to the public for the incident and that an investigation will be conducted. 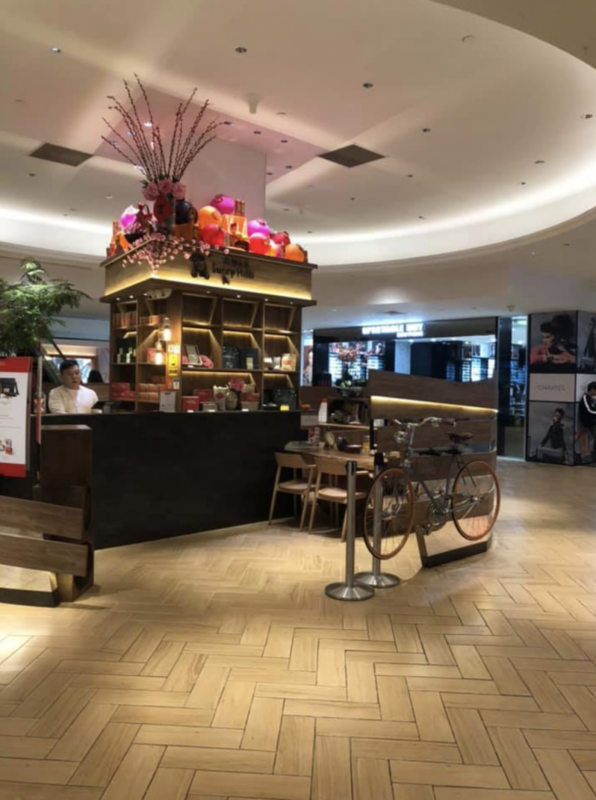 They also said that the “bicycle is a shop display and not meant to be a toy.” The staff responded the way they did because of safety concerns as they would be held liable should anything occur. 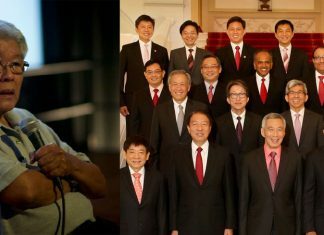 The Independent Singapore has reached out to the mother and she has given the following blow-by-blow of what happened. While she is not one who usually complains on social media, she wishes to clarify and give a detailed report on what happened because she has been receiving a lot of flak from strangers.